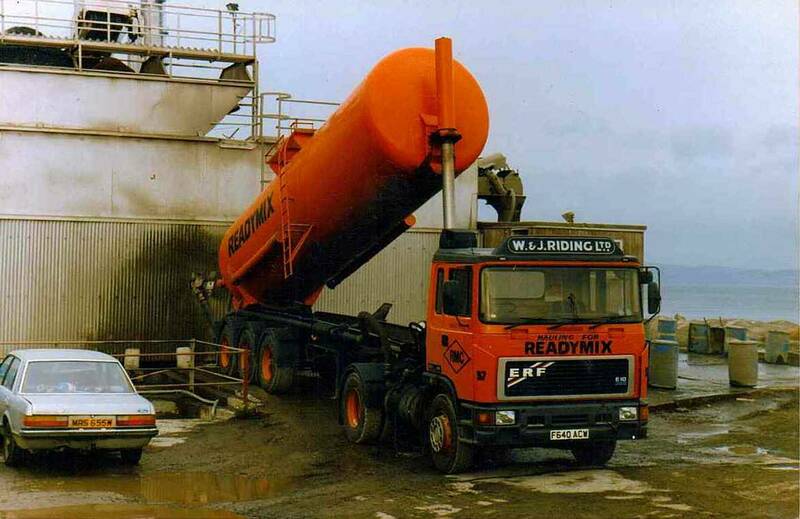 In 1987 a company from Greece started exporting cement over to the UK by ship into a large new terminal on Leith Docks Edinburgh. Ready Mix Concrete (RMC) were to purchase the cement from them but required a reliable haulier to move the huge quantities involved. 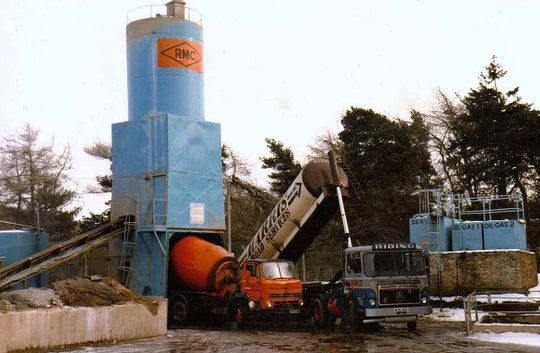 So it came about that Castle Cement, based in Clitheroe Lancashire, recommended W & J Riding who were approached by RMC to tender for the job and were duly successful. 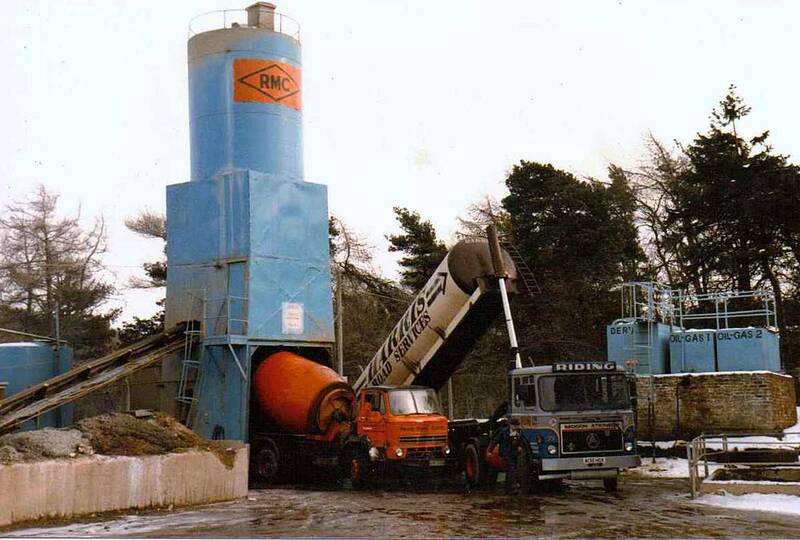 The contract was to collect from the docks at Leith all the bulk cement that RMC required and to deliver it to their various batching plants across Scotland. 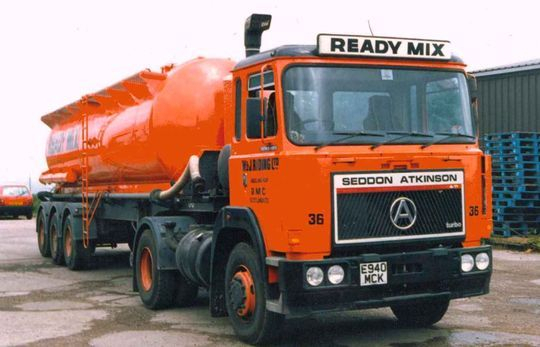 Initially the job required seven outfits, with W & J Riding eventually providing five brand new ERF and two brand new Seddon Atkinson 4x2 tractor unit's to do the job, along with the relevant cement tankers which were all painted in the striking orange RMC livery. "Initially when the contract began we were struggling for equipment so i borrowed a tank from Harris Road Services to start the job off. 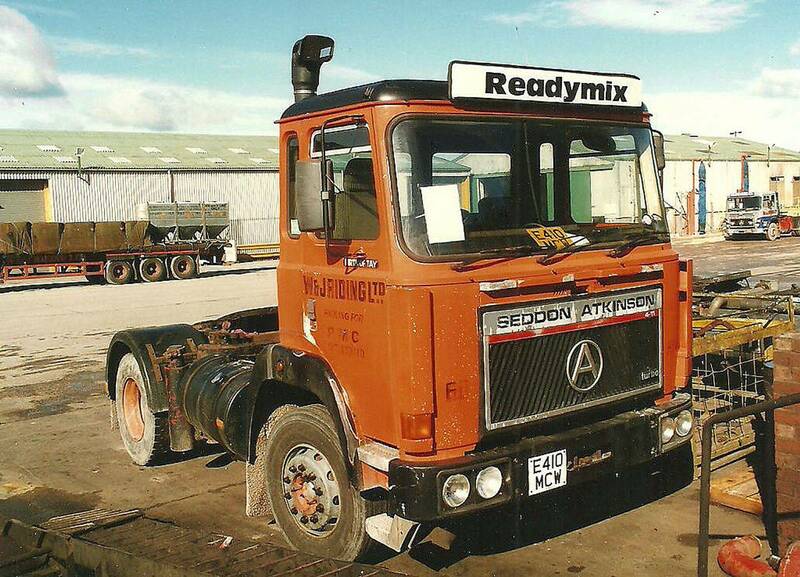 Hauled by Seddon Atkinson 301 Series 4x2 tractor unit Reg No A130 HCK Fleet No 77 'Sir Tristram', which was driven by Mick McKay, it is seen here discharging at the RMC batching plant at East Kilbride after collecting a load of cement from Leith Docks. The first two vehicles permanently assigned to the Ready Mixed Concrete contract were Seddon Atkinson 401 tractor unit Reg No RPL 122X Fleet No 16 'North Briton' and Reg No RPL 126X Fleet No 23 'Auld Reekie'. 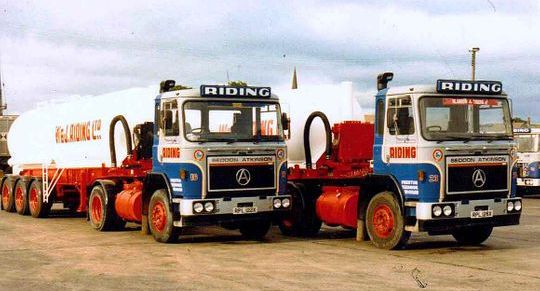 These two tractor units were part of a batch that Tom Riding bought second hand that were originally owned by London Carriers and were both fitted with Cummins E290 Big Cam engines. Seen here at Longridge, shortly before being sent to work in Scotland, they had been given a thorough overhaul and repainted in Riding's company livery. 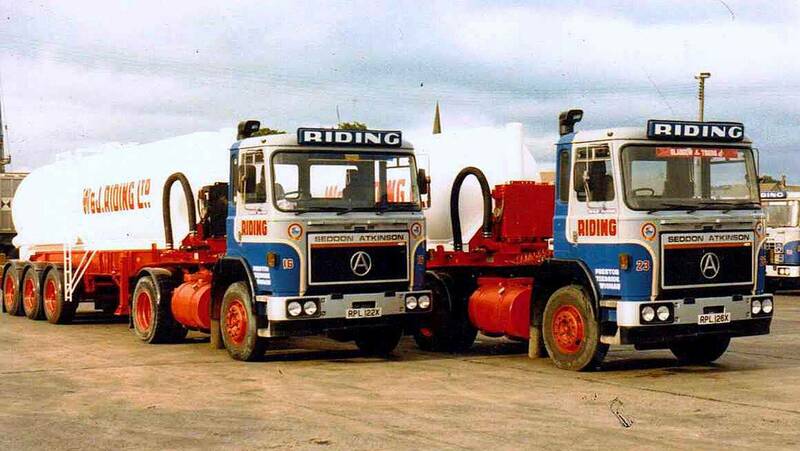 Notice the tanks at this stage were also in the Riding's company colours but were repainted in RMC livery soon after arrival in Scotland. Ex London Carriers Seddon Atkinson 401 4x2 tractor unit Reg No RPL 122X Fleet No 16 'North Briton' is pictured here discharging it's load of cement during the early days of the RMC contract in Scotland. 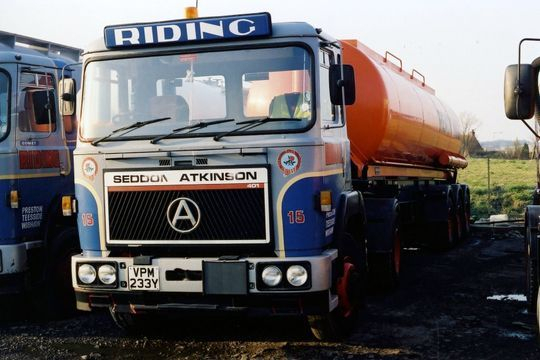 Seddon Atkinson 401 Series 4x2 tractor unit Reg No VPM 233Y Fleet No 15 'Black Douglas' was originally registered new on the 1st of August 1982 to London Carriers and bought second hand in April 1987 by Riding's when five years old. It is pictured here at Riding's Motherwell depot in 1988 coupled up to a RMC liveried tri-axle cement tanker. Day cabbed Seddon Atkinson 4-11 4x2 tractor unit Reg No E940 MCK Fleet No 36 'Firth of Forth' was powered by a Gardner 6LXDT engine. 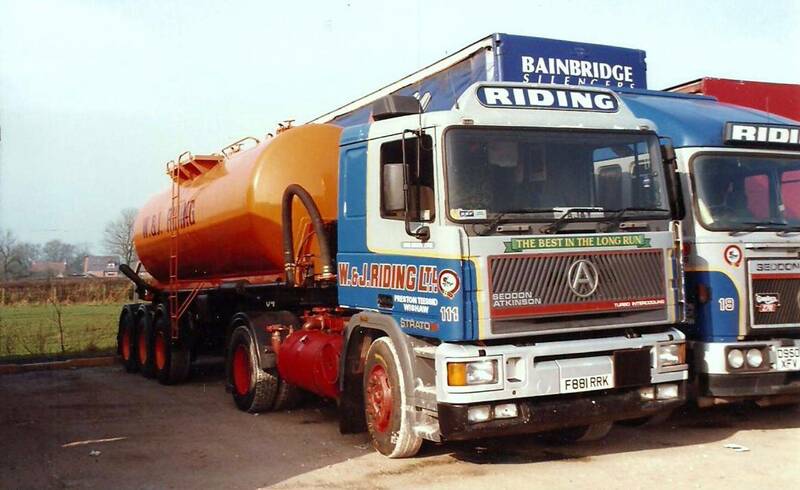 Registered new on the 1st of April 1988 this tractor unit and tanker were out based at Wright Brothers of Tranent East Lothian were it is seen here about to leave their yard. Tom Riding, who took the photograph, recalls that John Baillie, a local man, was it's regular driver at that time. An excellent on the road shot of Seddon Atkinson 4-11 4x2 tractor unit Reg No E940 MCK Fleet No 36 'Firth of Forth'. 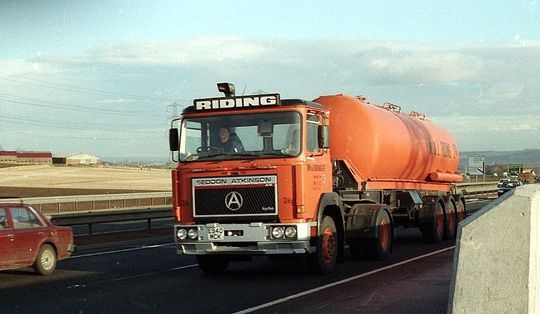 Pictured hauling a tri-axle cement tanker it is seen here in 1993 on the A720 Edinburgh by-pass between the Straiton and Lasswade junctions. Photograph courtesy of Steve Saunders. Seddon Atkinson 4-11 4x2 tractor unit Reg No E410 MCW Fleet No 60 'Firth of Tay' was another brand new addition to the RMC contract fleet on the 1st of April 1988. Based in Dundee, and seen here at Cardenden, it was driven by ex Blue Circle driver Jack Bremmner who is pictured standing proudly in front of the outfit which he always managed to keep immaculate. 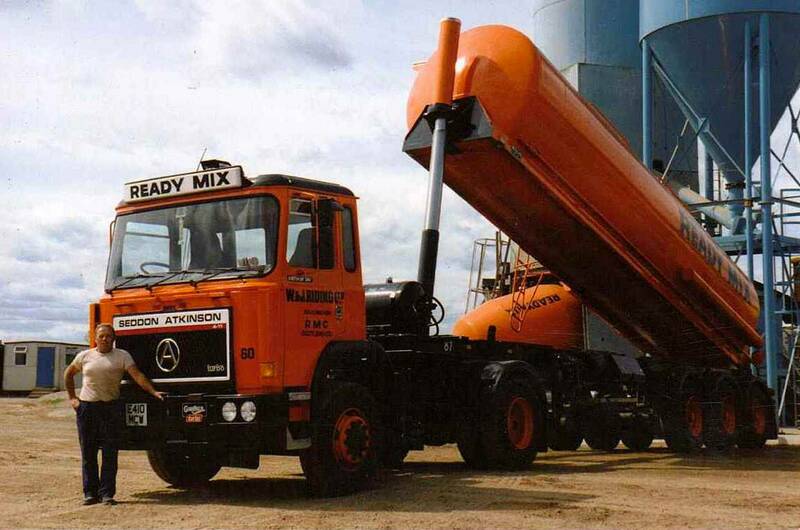 Seddon Atkinson 4-11 4x2 tractor unit Reg No E410 MCW Fleet No 60 'Firth of Tay', driven by ex Blue Circle driver Jack Bremmner, is pictured here while tipping at the RMC batching plant at Wormit which was located just south of the Tay bridge in Scotland. 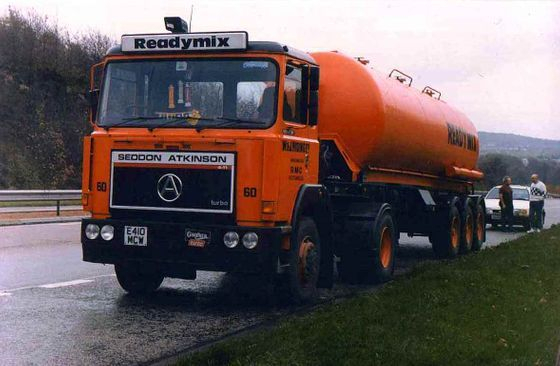 Another shot of Seddon Atkinson 4-11 4x2 tractor unit Reg No E410 MCW Fleet No 60 'Firth of Tay' this time pictured on the approach road to the Forth Road Bridge. On the left is driver Jack Bremmner who is talking to Motherwell depot manager the late John Elliot. Seddon Atkinson 4-11 4x2 tractor unit Reg No E410 MCW Fleet No 60 'Firth of Tay', new on the 1st of April 1988 is pictured here at the end of it's working life after returning South from Scotland. Pictured in October 1996 in the depot at Longridge Lancashire E410 MCW was scrapped the following month in November 1996. 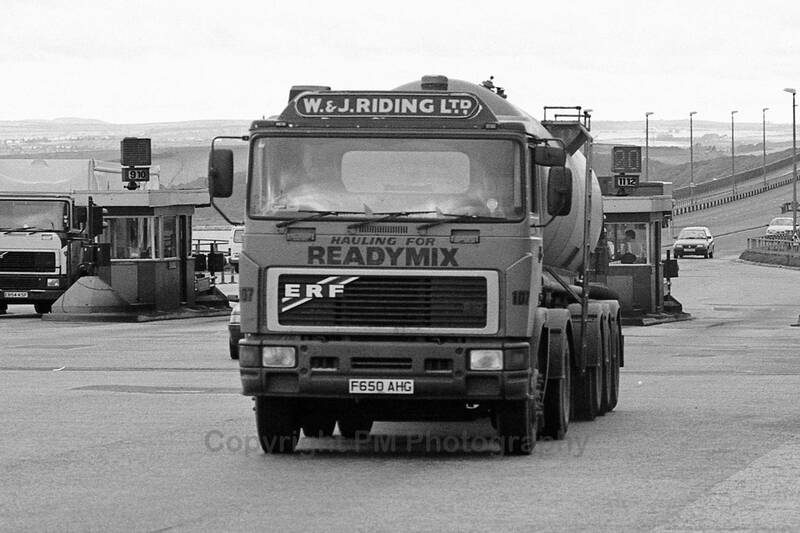 Registered new on the 17th of March 1989 ERF E10 325 4X2 tractor unit Reg No F640 ACW Fleet No 57 'Moray Firth' was assigned to the RMC contract at the begining of April 1989. 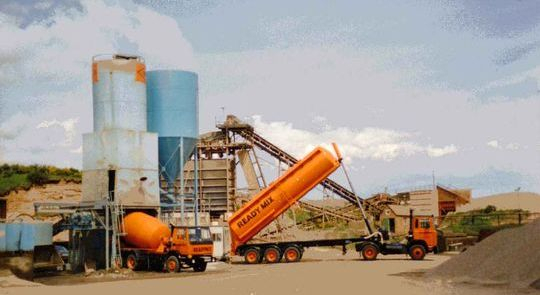 With the Forth estuary in the background it is seen here tipping cement at the RMC batching terminal at Leith Edinburgh. 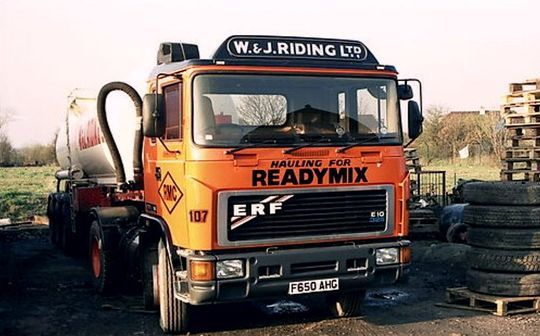 A nice on the road shot of ERF E10 325 4X2 tractor unit Reg No F640 ACWFleet No 57 'Moray Firth'. 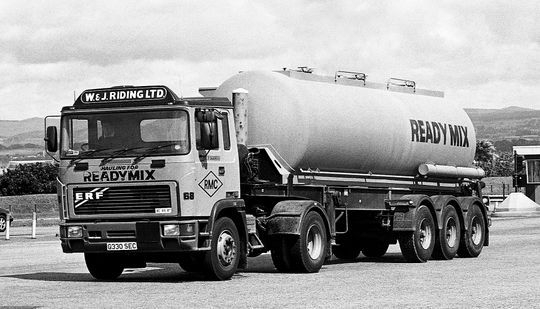 Registered new on the 17th of March 1989 it is seen here hauling one of the company's trademark tri-axle cement tankers. The image comes from the Jack London (Memorial) collection courtesy of the 'NA3T Transport Photos' (NA3T) who still have many tens of thousands of transport negatives waiting to be cataloged. 'E' Series ERF 4X2 tractor unit Reg F650 AHG Fleet No 107 'Dornoch Firth' is pictured here after exiting one of the long gone toll booth's on the Forth Road Bridge near Edinburgh. This was one of a number of brand new ERF tractor unit's assigned to the RMC contract during 1989 and 1990, with this particular one being registered new on the on the 1st of April 1989. A colour shot of 'E' Series ERF 4X2 tractor unit Reg F650 AHG Fleet No 107 'Dornoch Firth' parked up at Riding's Motherwell yard. 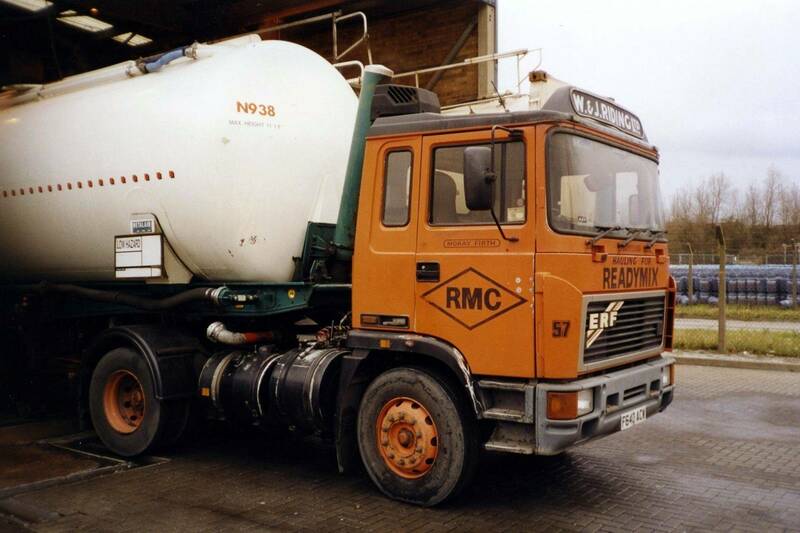 One of a number of brand new ERF tractor unit's assigned to the RMC contract during 1989 and 1990, Reg No F650 AHG was registered new on the 1st of April 1989. 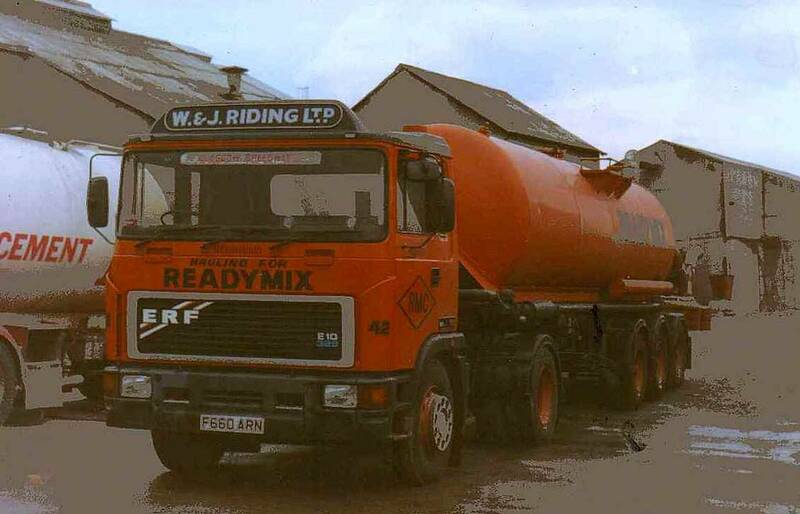 The tanker at this stage is still in W & J Riding's company colours but was later repainted in RMC livery. ERF E10 4X2 tractor unit Reg No F660 ARN Fleet No 42 'Formidable' was registered new by Riding's on the 1st of April 1989. Powered by a Cummins L10 325 engine F660 ARN was driven on a regular basis by Tom Brady. Pictured here at Riding's Motherwell depot it is seen here coupled to a Riding liveried tri-axle cement tanker which would have later been repainted in RMC's orange livery. ERF E10 4X2 tractor unit Reg No F660 ARN Fleet No 42 'Formidable' is again pictured at Riding's Motherwell depot this time on shunting duties. It is coupled to one of Riding's 45 foot tri-axle flat trailers loaded with empty GKN pallets destined for the Heinz plant at Wigan. These empty pallets would have been dropped off in the depot by other Riding's vehicles after delivering Heinz products to Scotland. As they were not required for the return leg due to loading up with steel plate from Ravenscraig the pallets were stored until there were enough for a full back load down south to England. Another shot of ERF E10 4X2 tractor unit Reg No F660 ARN Fleet No 42 'Formidable' this time seen coupled to a newly painted tri-axle cement tanker in RMC livery. 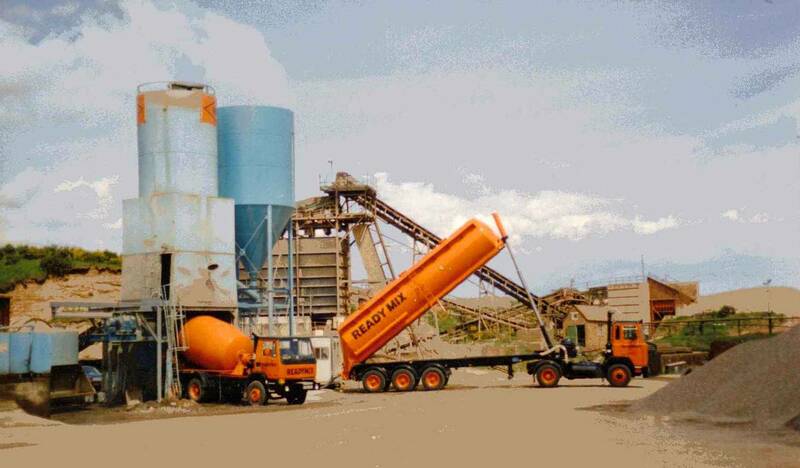 Registered new on the 1st of April 1989 F660 ARN was driven by Tom Brady and is pictured here at the Castle Cement plant at Coatbridge. ERF E10 4X2 tractor unit Reg No F660 ARN Fleet No 42 'Formidable', registered new by Riding's on the 1st of April 1989, is seen here in 1997 towards the end of its working life after coming off the RMC contract. 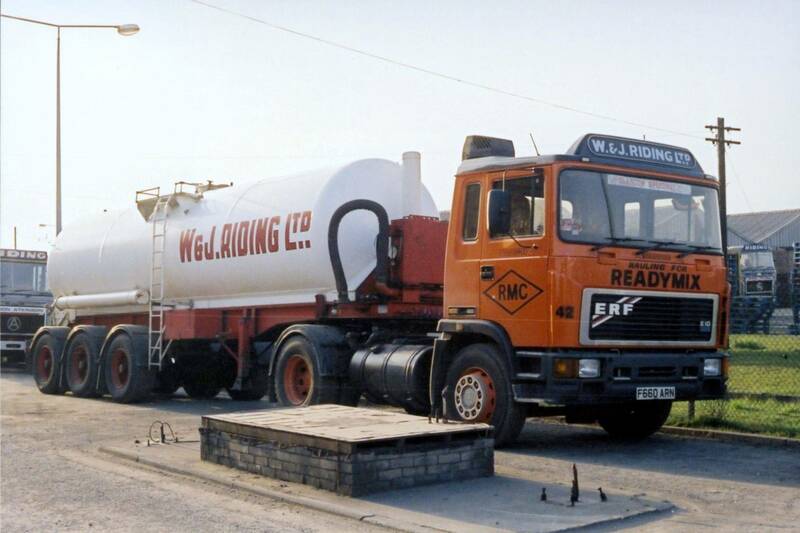 Still in it's original RMC livery it is seen here at the Nexus depot at Grangemouth being used as a shunter to place a Metalair 55 cubic metre tipping tank into the wash bay for a thorough clean and wash out. 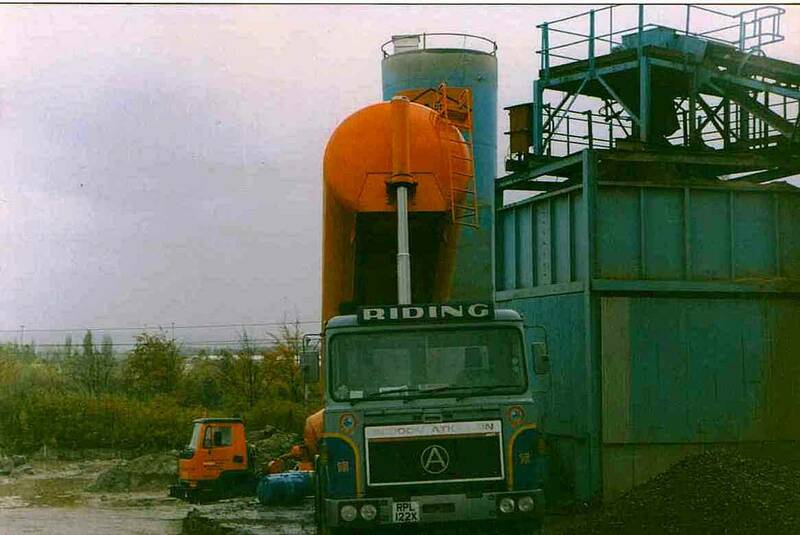 Tankers used on the movement of plastic products from BP Grangemouth were washed out after every load as a protection against contamination. Driven by Alan Greenwood it is seen here at Longridge depot in April 1993 while coupled up to a newly re-furbished and re-livered Carmichael tipping tank for use on the RMC contract. 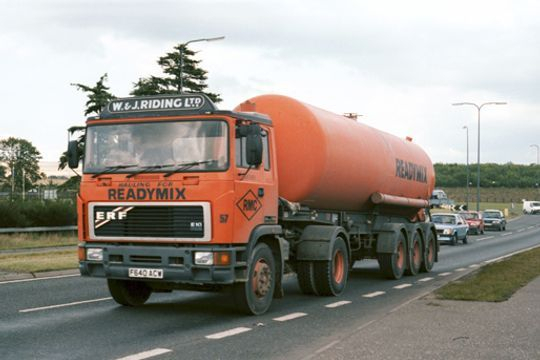 Not to miss out on a return load, after it's refurbishment at Longridge, the tanker would have been loaded with Castle cement for delivery in Scotland on its way back to Riding's Motherwell depot. 'E' Series ERF tractor unit Reg No G330 SEC Fleet No 68 'Wolf of Badenoch' was registered new on the 1st of March 1990 at a cost of £30,010 plus vat from ERF Ltd and was the last brand new Riding's vehicle to go on to the RMC Contract. Powered by a Cummins L10 325 engine, in line with a Fuller 11609 gearbox and Rockwell rear axle, it was fitted out with hydraulics and a Hammond high pressure compressor in Riding's own workshops. Driven from new by John Wardope it is seen parked up at Longridge depot with a load of ICI Ltd pallets for delivery in Scotland and had probably come down to Lancashire on a weekend flyer as it was not normally seen at South of the border. 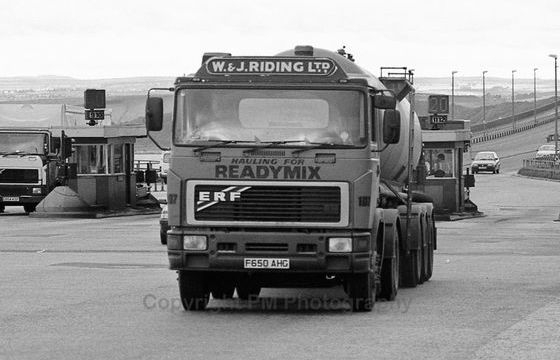 Another shot of 'E' Series ERF 4X2 tractor unit Reg No G330 SEC Fleet No 68 'Wolf of Badenoch' this time seen here at work in Scotland coming off the Forth road bridge while hauling a tri-axle cement tanker. 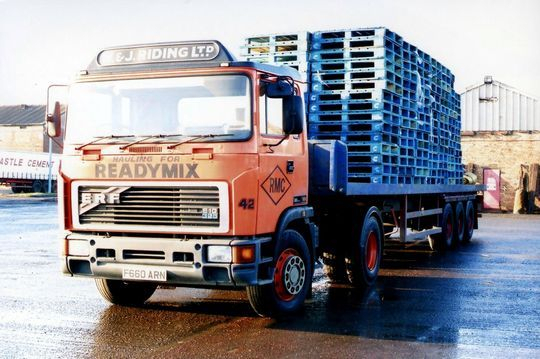 Introduced into the fleet on the 1st of March 1990 this was the last brand new vehicle supplied by Riding's to go onto the RMC contract in Scotland.